AMO GmBH, in collaboration with Alcatel Lucent Bell Labs, developed a graphene-based photodetector with a maximum data rate of 50 Gbit/s. They say this is the world's fastest photodetector. 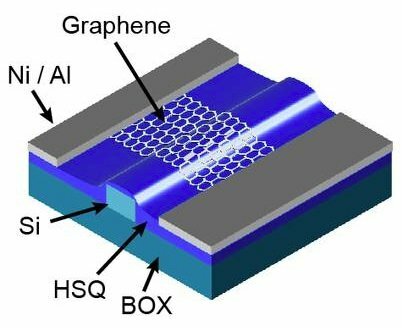 The graphene is used as the active element in this design, and the detector also uses nickel/aluminum (Ni/Al), hydrogen silsesquioxane (HSQ), and buried oxide (BOX). This research project was supported by the EU's Graphene Flagship project.